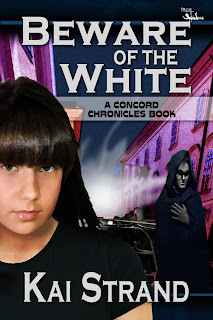 Authors, Kai Strand & LA Dragoni: Launch of Beware of the White by Kai Strand! Five words about BEWARE OF THE WHITE: Adventurous, Smart, Nail-biting, Funny, Cool! The Trepidus are the death janitors of the Underworld, responsible for delivering fatalities with a smile and cleaning up after themselves until Blanco, recent leader of the Trepidus, decides the day of reckoning for his species is coming. He begins organizing the creatures and leads them toward an uprising. The prophecy says there is one person who can stop him. Terra. To celebrate the launch of BEWARE OF THE WHITE, I have awesome book related prize packages. Be sure to enter to win (bottom of post). And return again and again to claim entries as you qualify. I will also have Spontaneous Giveaways during my book tour. Those giveaways won’t be announced so be sure to follow my tour closely so you don't miss any fast and furious giveaways. Only virtual stalkers will have the opportunity at all the fun! Kelly Hashway Spotlight on the threat! Melanie Robertson-King Spotlight on the players. Happy Launch Day!!! The book sounds great! Happy Launch day. May good reviews be with you. Ha ha. Awesome wish, thanks! Hooray for Launch Day. Celebrate well. Thank you, Susan. I will. Launch days are the pinnacle for an author, aren't they? Wishing you a wonderful launch, Kai. What a fantastic tour schedule and so much fun going on. So happy for you! I'm really looking forward to all the stops! So many generous people helping in so many ways - including you! Thanks, Jo. I hope your tour's going really well, I enjoyed reading your post on Darlene's blog.